This PowerShell script will help an Office 365 administrator or Exchange Online administrator block incoming email messages originating from specific countries using data from IPdeny. IPdeny compiles raw data from regional internet registries and offers free of charge country IP address block downloads. Their country IP zone files can be used to minimize on-line fraud, SPAM, floods, or brute force attacks. This is the source of information my script will use. Mail flow rules (also known as transport rules) identify and take action on messages that flow through your Office 365 organization. Mail flow rules take action on messages while they’re in transit before the message is delivered to a mailbox. This is the target that my script will use to create rules using IPdeny data. You will end up with about 230 IPv4 and 230 IPv6 new Mail Flow Rules. All rules will be Disabled and All rules will be sorted last in priority. My intention is you use this script to Create new rules, but then logon to Office 365 > Exchange admin center > Mail Flow > Rules to Enable and change Priority for the newly-created rules that interest you. Optionally, my script should be easy enough to modify to also automate those tasks as well. 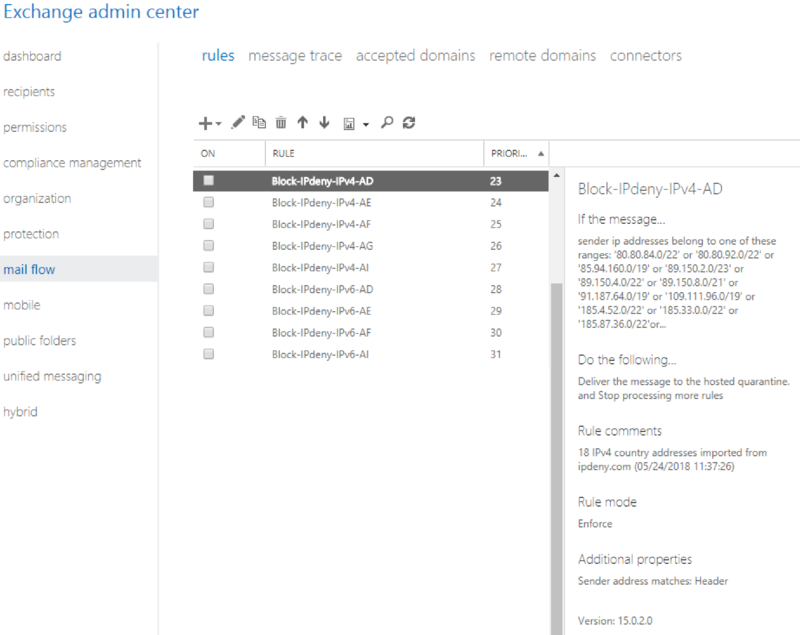 $Comments = "$CountIPs IPv4 country addresses imported from ipdeny.com ($Date)"
$Comments = "$CountIPs IPv6 country addresses imported from ipdeny.com ($Date)"
The result in Office 365 > Exchange admin center > Mail Flow > Rules will look like this. Note that I imported only a few IPv4 and IPv6 rules (an option in my script). By default, my script will create about 460 new rules; two for each country (IPv4 and IPv6). Note that all an Exchange Online admin has to do at this point is to Prioritize and Enable the rules for the countries they wish to block. Each rule is named by the country’s two-character abbreviation and each Rule Comment tells you how many IP blocks were imported and when. You may re-run this script any time. It will delete existing Rules and create new ones with the updated data from IPdeny. I hope someone finds this PowerShell script for Office 365 Exchange Online and IPdeny helpful.